JPMorgan Chase, the Wall Street mega bank now under criminal probes for losing billions of FDIC insured deposits in risky derivative trades, for years has been one of the dinner hosts of an unseemly industry trade and lobby group established by none other than the Federal Reserve Bank of New York, its own regulator. On the evening of October 8, 2009, representatives of the largest Wall Street banks enjoyed cocktails and dinner at 270 Park Avenue in Manhattan, the headquarters of JPMorgan Chase. Bill Hirschberg of Barclays was there; Jeff Feig of Citigroup; Troy Rohrbaugh of JPMorgan; Fabian Shey of UBS and numerous others. Also enjoying the food and conversation were seven officials from their regulator, the New York Fed. The Fed attendees were: Steven Friedman, Marcus Lee, Susan McLaughlin, Patricia Mosser, Jamie Pfeifer, and Brian Sack. Michael Nelson, currently Counsel and Senior Vice President of the New York Fed was also in attendance. The group is called the Foreign Exchange Committee and its sponsor is the New York Fed, the same body tasked with policing these firms to root out illegal conduct. The BBA refers to the British Bankers Association, a trade association that oversees Libor, the interest rate setting mechanism for financial products used globally. The public learned earlier this year that the rate has been rigged for years by an international banking cartel. It’s curious enough that an official from the Bank of England was at this meeting, but even more curious were two other guests: Susan Gammage of Thomson Reuters and John Nixon of ICAP. Thomson Reuters is the company that assists the BBA in calculating and announcing Libor interest rates. ICAP is an inter-dealer broker implicated in the Libor rate-fixing matter. The host of this event, JPMorgan, is under investigation in the Libor matter as is Citigroup, which also sent a representative. Barclays, which was in attendance, has already admitted to and settled the charges with fines of $453 million by U.K. and U.S. regulators. UBS is said to have a whistleblower providing evidence to investigators. Traders from ICAP have been implicated by the Canadian Competition Bureau, as have JPMorgan and Citigroup. Whether the banking cartel was meeting this night to discuss the allegations of rigging Libor with their regulator behind closed doors is not known. The New York Fed, which sent seven officials to the meeting, had known about Libor misconduct since 2007 but did not make the matter public. Nor did it refer the matter to the U.S. Department of Justice. 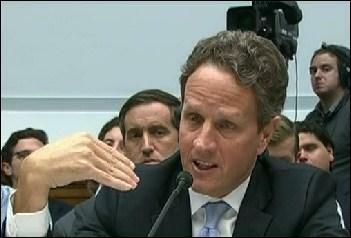 Timothy Geithner, then President of the New York Fed, is now the U.S. Treasury Secretary. Conveniently, the U.S. Treasury Secretary was given the power under Dodd-Frank financial reform to decide if foreign exchange trading should be exempted from derivatives regulation. In April of last year, Geithner requested the full exemption. The same could certainly be said for the New York Fed in setting up an industry lobby and self-governance group in the field of foreign exchange. The Commodity Futures Trading Commission (CFTC) is the regulatory body tasked with regulating futures and derivatives. How the New York Fed carved out a niche for itself and the largest Wall Street firms in the gargantuan $4 trillion a day foreign exchange market should command the interest of Congress. As JPMorgan faces multiple probes on multiple continents, its Chairman and CEO, Jamie Dimon, sits on the Board of Directors of its regulator, the New York Fed. Coming up on October 3 at 4 p.m. will be another Foreign Exchange Committee event hosted by JPMorgan Chase with the group’s sponsor, the New York Fed, no doubt in attendance.